A guest post by Stephen D. Winick, Ph.D. 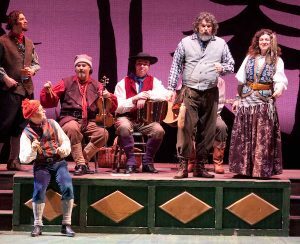 This French-Canadian Revels includes a selection of ancienne musique and nouvelle musique Québécoise, blending old French tradition and New World ingenuity with a modern flair. On his first trip to the New World, in 1534, explorer Jacques Cartier found a rich land inhabited by Huron and Iroquois Indians. He promptly claimed it for France. After permanent settlement began in 1608, immigrants to Québec came from all over France, but especially from several provinces in the north and west: Normandy, Picardy, Anjou, Poitou, and Brittany. Not surprisingly, many of the traditional French songs we now find in Québec are common in those provinces as well. “Dans les prisons de Nantes,” for example, is set in Nantes, an important city that was historically the capital of Brittany. Located at the confluence of the Loire, the Sevre, and the Erdre, Nantes may be remembered fondly by many of our villagers as a model for their own Trois-Rivières. 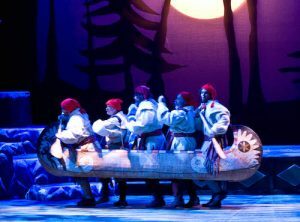 The traveling fur-traders known as voyageurs were crucial to the survival and development of folk song in Québec, for several reasons. First, they spent months in small groups traveling over rough country; in such a community, a good repertoire of songs could be the difference between a valued companion and a tedious bore. Thus, the voyageur life encouraged men to learn and sing songs. Second, voyageurs spent the greatest part of their time paddling great canoes along rivers, or carrying cargo on their backs during portages. Singing became their method of keeping their paddling coordinated and their marching steady, and they adapted all manner of traditional songs into work songs. We owe much of our knowledge of this early Québécois music to a number of collectors, none more important than the pioneering folklorist Marius Barbeau, who collected over 13,000 songs from oral tradition. Many Québécois folk songs are done in call-and-response style, mirroring the tradition of western France. This tendency was reinforced by the voyageurs. Call-and-response allows a group to sing a song as long as one member knows it, which greatly increases the number of songs that can be sung en masse. Call-and-response also allows each singer time to rest and breathe while the others are singing, which is important when you are paddling a canoe at 40 to 60 strokes a minute! In this Christmas Revels, several songs, including “Canot d’ecorce” and “C’est la belle Françoise,” follow this call-and-response pattern. Traditionally, Québécois folk songs were sung unaccompanied, either solo or in unison. We have added vocal harmonies and instrumental accompaniment, borrowing elements from later Québécois performance style. The instruments most appropriate to our period are the fiddle, flute, bones, and…feet! Bones—known as os in French—are usually the rib-bones of an animal, held two (or more) in each hand, and shaken or rolled so that they click together rhythmically. Violins, along with bagpipes and hurdy-gurdies, were among the most popular instruments for dance music in France during the period of Québécois settlement. Bagpipes and hurdy-gurdies did not travel to the New World, so the fiddle predominated. But flutes, including wood and bamboo instruments, were also on the first ships bringing French settlers to the New World. In the absence of instruments, people sometimes made music by singing nonsense syllables, a vocal technique known as turlutter. A well-known, indeed, defining feature of Québécois folk music is a persistent galloping rhythm tapped out with the feet. In the past, a fiddler or singer would simply tap his feet to provide percussion. Nowadays, many bands equip a musician with a special board to amplify the sound of what has come to be called podorythmie. Accordions, invented in the 1820s, became popular in Québec only at the end of the 19th century. In the same period, harmonicas, pump-organs, and eventually pianos came to be used in Québec. Guitars—especially four-course and five-course baroque guitars—have been known in Québec since the 17th century. However, the six-string guitar did not emerge until at least the 18th century, and its use in traditional Québécois folk music is a 20th-century development.